Some of the easter eggs in Ant-Man aren't as obvious as others. Use this guide to help you find the secret geeky gems that will help you appreciate the movie in a wider sense of its role in the Marvel Cinematic Universe. And when future Marvel movies come out, return to this place and see if there are other connections that were first revealed in Scott Lang's first big screen adventure! Perhaps the biggest easter egg for die-hard fans familiar with the comic books that Ant-Man comes from is the reveal of The Wasp in the movie's first stinger in the credits. As played by Evangeline Lilly, Hope van Dyne is speaking with her father (Michael Douglas), who has had a change of heart concerning his daughter's wish to play superhero. 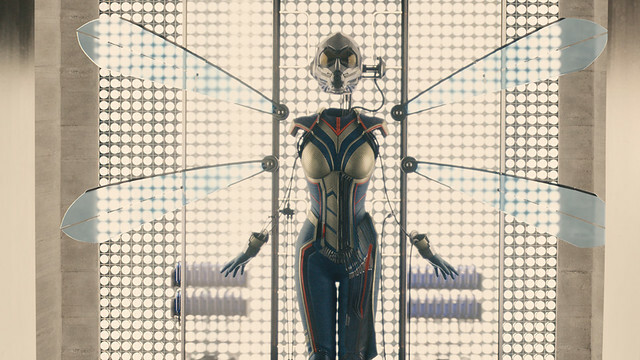 Dr. Pym reveals the costume that he had been working on before Hope's mother vanished into the quantum realm, and it's a near picture perfect recreation of The Wasp's costume from the Marvel comics. While the only flashback in the film showed Janet Van Dyne wearing a red-and-silver costume similar to the Ant-Man one, Hope's future Wasp costume is of a black-and-gold motif. That's exactly how it appears in the character's appearance in The Avengers comic book series, and it's likely to be pretty close to how she'll look flying around in Ant-Man and the Wasp, scheduled for release in July 2018. In a blink-and-you'll-miss-it moment, one of the terrorist bidders at Darren Cross' Yellowjacket tec auction sports a neck tattoo of The Ten Rings, the criminal sect topped by The Mandarin. This is one of two very subtle nods to the larger shared neighborhood that all Marvel Studios movies play in, the Marvel Cinematic Universe. 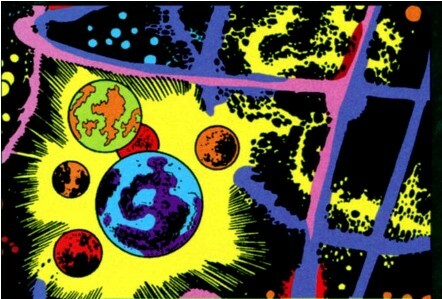 Hank Pym doesn't call it that, but the region of quantum space where he lost his wife Janet to is Marvel's Microverse. In the comics, shrinking down to atomic size allows Ant-Man to enter a parallel universe filled with strange worlds and populated by weird alien civilizations. Other Marvel heroes have traveled to the Microverse in the comics, such as the Hulk, and the most famous of characters to come from that realm were the Micronauts. Undoubtedly this story beat is to set up a possible future adventure where Ant-Man travels and meets with the Microverse's denizens, and perhaps even the long-lost Janet Van Dyne. For now, it's a soft way to open the door for explorations into the quantum realm, and perhaps even for heroes like Doctor Strange. If you go into watching Ant-Man not knowing Marvel Comics lore, then you'll take Scott Lang's 10-year-old daughter for what she is on-screen. In the comics, Cassandra Lang is now grown up and does her own superheroing under the codename of Stature for the Young Avengers. She has the same shrinking/growing ability as her Dad, but does things her own way. If Paul Rudd does a three-peat playing Scott Lang in a trilogy of Ant-Man movies, perhaps after the third film Marvel Studios would turn the mantle over to Cassie to play with. After all, if we're thinking that it would be about nine years off, Rudd would be 56 by then while the actress that plays Cassie in the Ant-Man movie, Abby Ryder Fortson would be 17-years-old. The math checks out! Close to the end of the film Michael Peña's character Luis rattles off some new super-powered folk making waves in the gossip world. One of these is someone who can "crawls up on walls". C'mon, that's got to be none other than Spider-Man! With Marvel Studios now calling the creative shots for Sony's Spider-Man movie franchise, it's pretty easy to make the leap and assume that's the guy Luis was referring to. Whether Spidey would make an appearance in the Ant-Man sequel is up for grabs; while the two heroes co-exist in the same universe's dojo, they operate from opposite sides of the country. Still, perhaps Spider-Man will meet Ant-Man face-to-face in Captain America: Civil War, and the two will trade phone numbers. While trying to see if Hank Pym would reveal the existence of his rumored shrinking discoveries, bad guy CEO Darren Cross refers to the mysterious tech as "propaganda, tales to astonish." In fact, Marvel Comic published a series called Tales to Astonish that featured the first appearance of Ant-Man back in 1962. It's a small easter egg, but one that classic Marvel fans will definitely hear when uttered. 7. Garrett Morris is Ant-Man! Whether this was an intentional casting job or a cosmic coincidence, that super-brief appearance of a taxi cab driver that Scott Lang crashes into during his first shrinking trip is played by former SNL cast member Garrett Morris. Four decades before laying eyes on Paul Rudd as Ant-Man, Morris played the first on-screen appearance of the character in a comedy skit on Saturday Night Live. How weird is that? We're guessing that with the comedy experience that writers Adam McKay, Paul Rudd and director Peyton Reed have together, this one was planned out. The cheap hotel that Scott Lang is living at is called the Milgrom Hotel for a very specific reason: writer Al Milgrom was a staple of Marvel Comics' pullpen back in the 1970s. Milgrom wrote several of Ant-Man's adventures for the comics, and this is a nice way for the filmmakers to give a shout out to one of the key creative people that developed the character in their comic book days. In the flashback that starts the film we're treated to a scene set in S.H.I.E.L.D. in the late 1980s. Along with a younger Hank Pym, an older Peggy Carter (Hayley Atwell) and a still older Howard Stark (John Slattery), we're also introduced to a new face in the MCU: Mitchell Carson. In the comic books, Carson was indeed an agent of S.H.I.E.L.D., and was also meant to wear a version of the Ant-Man costume. Alas, he never did. A super-remote easter egg to be sure, but if you heard someone shout out "I know that guy!" in the theater, this is the reason why. Set decorators love to put things into the background of a scene. Sometimes these easter eggs get picked up and seen in the final theatrical cut of the movie, but a lot don't. One of these treats did wind its way up into the final cut for Ant-Man. Look for the scene where Hope van Dyne is resting against her father's mantle. Off to the side of her arm is a small red chair. Waaaay back in the original Tales to Astonish appearance of Hank Pym as Ant-Man, he tests out his Pym particles on a red chair -- turning it into the size that you see in the movie. Is this intended to be the same chair, perhaps from the initial experiment where Pym discovered his particles? Were there other easter eggs that you caught when watching Ant-Man? Perhaps some that would hint as to what direction Ant-Man and the Wasp could be headed?